For a recap of last week's box office totals, read our box office wrap-up from The World's End's opening weekend - and scroll to the bottom of this post to see how our previous picks measured up. Full disclosure: Box office predictions are not an exact science. We acknowledge that our picks may not always be correct. For the sake of offering a jumping off point for discussion, here are our picks for the weekend of August 30th - September 2nd, 2013. This weekend, the thriller Closed Circuit opens in 800 theaters, the action movie Getaway debuts in over 2,000 theaters, and the 3D concert movie One Direction: This Is Us opens in over 2,500 theaters. Instructions Not Included sees a limited release of 350 theaters and The Grandmaster is getting an unspecified expansion. Our pick for first place is Lee Daniels’ The Butler (read our review), which has won the previous two weeks. Last weekend, the historical drama grossed $16.5 million and should continue to perform strongly. The film has received critical praise, Oscar buzz, and has won over audiences, as well. Even if the numbers dip a bit, the new releases hitting theaters come with very little fan fare, which could help The Butler three-peat. We’re expecting the comedy hit We’re the Millers (read our review) to place in second again. Like The Butler, the Jason Sudeikis/Jennifer Aniston vehicle has been riding a wave of strong word-of-mouth during its theatrical run and will likely pass the $100 million mark by the end of the week. Since the new releases are not tracking that well, We’re the Millers should continue to draw people in. Our choice for third place is the action-thriller Getaway. While the film has received little marketing, star Ethan Hawke is somewhat recognizable to casual audiences thanks to the box office performances of The Purge and Sinister. As one of the few action movies playing, it will also receive little genre competition during the Labor Day weekend. Its presence probably won’t be strong enough to unseat the reigning top two, but it should still do well on its own. The latest 3D concert film One Direction: This Is Us is our pick for the fourth spot. The boy band is one of the biggest names in pop music thanks to their breakout commercial success last year, but theatrically released concert movies rarely breakout at the box office. For comparison’s sake, last year’s Katy Perry: Part of Me only made $7.1 million during its first three days and 2011’s Glee: The 3D Concert Movie opened with $5.9 million. Music acts have their fans, but it appears moviegoers are not among them. Rounding out the top five should be The World’s End (read our review). The final installment of Edgar Wright’s Cornetto trilogy pleasantly surprised many by making $8.7 million in its first weekend. 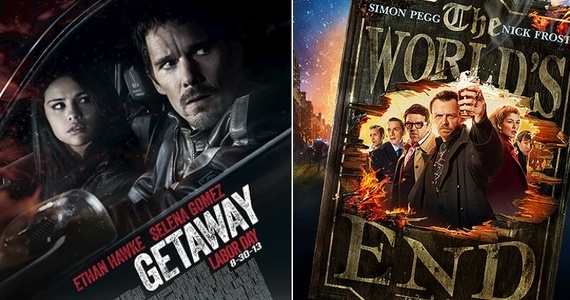 While it should become the highest-grossing film of the three Wright/Simon Pegg collaborations, it does not seem likely that The World’s End will have strong legs at the (US) box office. Our number ten tiebreaker is Elysium (read our review). Neill Blomkamp’s second film finished last weekend in seventh place. The third major release of the weekend, Closed Circuit is only being shown in 800 theaters, which will limit its potential to crack the top five. Also, it’s opening on Wednesday, August 28, so audiences who are interested in it could check out before the weekend, which would lower the three-day numbers. Last Week’s Official Box Office Battle Reader Winner (The World's End opening): Sal reports that Sam Howard was the winner with a score of 12.